Locally Brewed celebrates the Midwest’s craft brewing movement with profiles of 20 of the area’s brewmasters and their breweries. These are entertaining and inspiring stories of the individuals who have been essential in the exponential growth of this movement, as told through vivid interviews, beautiful photography, and dynamic artwork. In just the past 20 years, beer has been transformed from a “low-class” drink to a pluralistic, populist drink with the same stylistic diversity and caring craftsmanship as wine. One of the strongest hotbeds of this cultural shift is in the Midwest, where independently owned craft brewers focus on the creative, artisanal elements of the beer-making process. Locally Brewed explores these trends and the fun, fascinating, and unique details of each brewery, including label art, hand-pull designs, and of course the brews themselves. As the craft beer craze continues to sweep the nation, more and more people are deciding to try their hand at creating their own perfect brew. In Craft Beer for the Homebrewer, beer writer and certified cicerone (think sommelier for beer ) Michael Agnew merges the passions of consumption and creation into one definitive guidebook, designed for the craft beer lover who also happens to be a homebrew enthusiast. 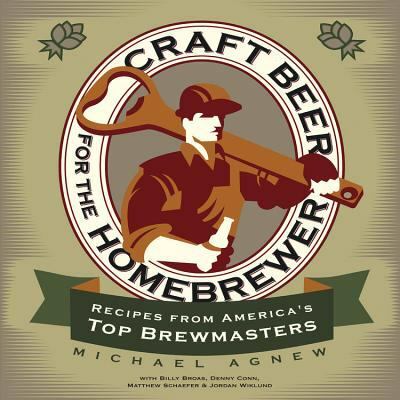 Agnew presents dozens of recipes adapted by craft brewmasters for the homebrewer to make in his or her own kitchen, basement, garage, or patio. 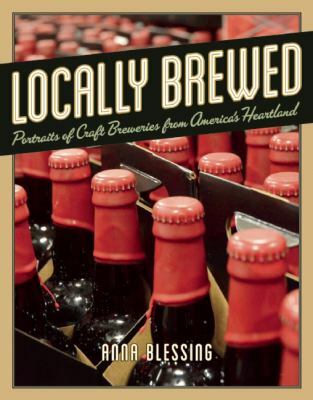 Based on the actual production beers of featured microbreweries, these recipes cover the entire range of beer styles – ambers and pales, IPAs, stouts and porters, Irish and Scottish ales, Belgians, and wheats – representing craft breweries from across the United States. Each recipe is accompanied by full-color photography, an ingredient list, instructions for both the mash and extract brewer, and historical and anecdotal notes about the brewery that provided it. Agnew prefaces the book with an introduction to the craft beer industry, briefly discussing the major ingredients and required equipment that homebrewers will encounter inside. Before Red Bull and Monster Drink the victual of health around Davenport was a frothy mug of suds. There weren’t national brands in refrigerated trucks endorsed by athletes and scantily-clad models in the first half of the century. Each town had their own local brands, crafted by mustachioed laborers using recipes from the Fatherland. 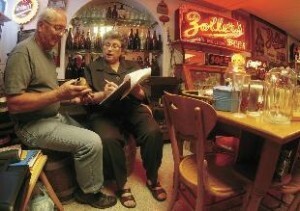 For the 20 percent of Davenport Germans, it was a beverage steeped in tradition and culture, and one of the few remaining creature comforts they could control. They did so with a flourish as a number of brands sprung up in Davenport, including Mathias Frahm and Son, Koehelr and Lange (also known as the Arsenal Brewery), Littig Brohers, and Zoeller Brothers. All of this information is featured in the latest exhibit at the German American Heritage Museum as you look at snapshots of the malthouse workers, tavern operators, and ancient conetop cans and vessels. I found it to be a fascinating little tour and a great excuse to visit the GAHC for the first time, at the low Depression-era price of $2. Ever wonder which wine to have with a meal? Ever debate the pairing of different beers with specific foods? Ever argue with your SO about which is better, beer or wine? 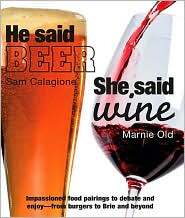 He Said Beer, She Said Wine by Sam Calagione and Marnie Old will not only educate and entertain you, it’ll provide you with fresh issues to debate. Written by two acknowledged experts in their field, this book starts with an overview of each beverage, the basics of how each is produced, a discussion of varieties and styles and how to taste and evaluate each one. 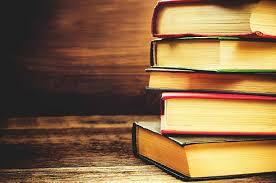 The heart of the book discusses pairing wine and beer with different foods such as cheese, vegetables, sandwiches, pizza, fish, pasta, chicken and desserts. The final section is the fun part – bringing the debate home. Calagione and Old describe how to have a wine versus beer party, including giving you ideas on how to set up voting, sample menus and wine/beer pairings, and recipes. Smart but never stuffy, this lavishly illustrated book is sure to encourage lots of friendly debate – and might even have you believing in the value of the other beverage, no matter what side you’re on.